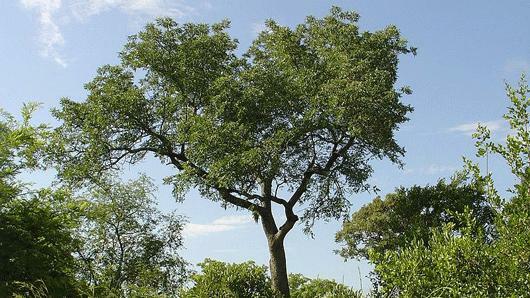 An African tree with juicy fruits that are much sought after by many local people, marula is a member of the Anacardiaceae, the same plant family to which mangos and cashews belong. Marula fruit is highly prized by many animals, from elephants to mongooses - although the story that they can get drunk on fermented fruit is probably just fiction. The fruit pulp is made into a popular alcoholic drink, known as maroela mampoer or amarula. In the drier savannah regions. Marula is distributed from Senegal to Ethiopia and south to South Africa and is also found in Madagascar. Overview: A tree up to 18 m tall, with a rounded crown (the leafy part of the tree) and cracked, grey bark. Trees are either male or female. 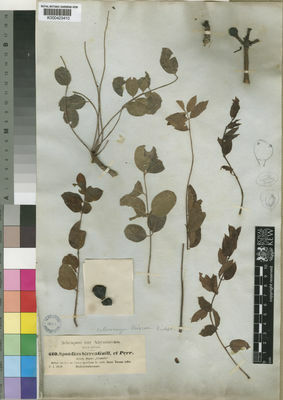 Leaves: Divided into 7‒21 leaflets with separate points of attachment along a central axis. Flowers: Small, whitish-purple to red, in tight groups on long stalks (male flowers) or in clusters of 1‒3 (female flowers). Fruit: Yellow, round or egg-shaped, 2.5‒5.0 cm across, with a juicy flesh surrounding a hard stone. Marula fruit is prized by many African people. It has a delicate nutty flavour and contains a higher concentration of vitamin C than oranges. The stone is high in protein, and the seed oil contains antioxidants. A decoction of the bark is used medicinally against malaria, scorpion and snake bites, dysentery, diarrhoea and haemorrhoids. An infusion of the fruit is used to bathe cattle with the aim of destroying any ticks present. The wood is used for furniture, planks, carving and utensils. Rope is made from the inner bark, and the bark also yields a red-brown dye used in traditional crafts. 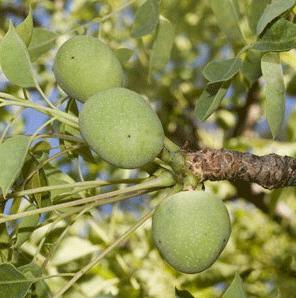 The nectar attracts insect pollinators, and marula is often planted to attract pollinators to farms. Eight collections of marula seeds are held in Kew's Millennium Seed Bank based at Wakehurst in West Sussex. Marula can be grown from seed or from sticks planted during the early rainy season. It can grow up to 1.5 m in a year but will not tolerate frost. Sclerocarya birrea is grown in the behind-the-scenes Tropical Nursery at Kew. 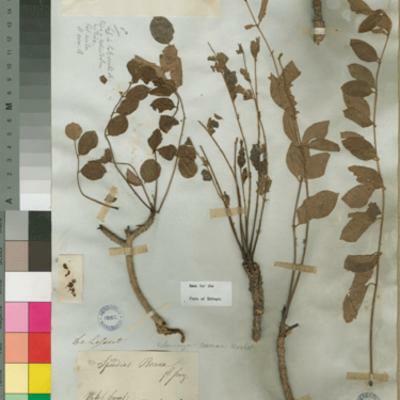 Dried and alcohol-preserved specimens of Sclerocarya birrea are held in Kew's Herbarium, where they are available to researchers by appointment. 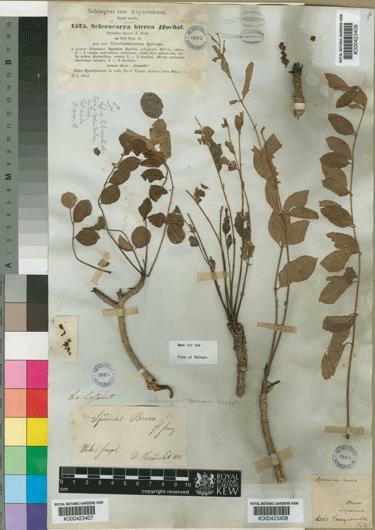 The details of some of these specimens, including some images, can be seen online in Kew's Herbarium Catalogue. Specimens of marula wood and bark and a box of marula-flavoured biscuits are held in Kew's Economic Botany Collection in the Sir Joseph Banks Building, where they are available to researchers by appointment. Wooded grassland, woodland, bushland on rocky hills. A spreading deciduous tree up to 18 m. high; bole pale grey, widely reticulate and flaking in small or large scales. Leaves variable, 7–37-foliolate, 10–38 cm. long; rachis semicylindric, grooved above, glabrous; leaflets round, ovate, obovate, elliptic or oblong-elliptic, 0.8–9(–11) cm. long, 0.7–3.5(6) cm. broad, acuminate or cuspidate to obtuse or apiculate at the apex, asymmetric and slightly cuneate or rounded at the base, margin entire to dentate-serrate (especially on new outgrowths), lateral ones sessile or with petiolules up to 3 cm. long, the terminal petiolule up to 5 cm. long, membranous to semicoriaceous, glabrous; midrib prominent beneath; lateral nerves distinct on both sides and impressed or slightly raised and reticulate beneath. Male inflorescences 7–22 cm. long; peduncle puberulous; bracts ovate, ± 2 mm. long by 1.5 mm. broad, obtuse, puberulous or glabrous. Male flowers:sepals ± 2 mm. long and broad; petals oblong-ovate, 4–6 mm. long, 3–4 mm. broad, obtuse, yellow to dark red with cream margins; filaments ± 3 mm. long; anthers 1–1.5 mm. long. Female inflorescences shorter, usually 1 or 2(–3)-flowered; peduncle and pedicels thickened during fruiting stage; sepals and petals similar to ♂; staminodes present; ovary subglobose. Male inflorescences 7–22 cm. long; peduncle puberulous; bracts ovate, ± 2 mm. long by 1.5 mm. broad, obtuse, puberulous or glabrous. Male flowers:sepals ± 2 mm. long and broad; petals oblong-ovate, 4–6 mm. long, 3–4 mm. broad, obtuse, yellow to dark red with cream margins; filaments ± 3 mm. long; anthers 1–1.5 mm. long. Female inflorescences shorter, usually 1 or 2(–3)-flowered; peduncle and pedicels thickened during fruiting stage; sepals and petals similar to ♂; staminodes present; ovary subglobose. Drupe obovoid, 3–3.5 cm. in diameter, yellow and with a very juicy mesocarp; stone obovoid, 2–3 cm. long, 2.5 cm. in diameter. Seed 1.5–2 cm. long, 0.4–0.8 cm. wide. Sacande, M., Sanou, L. & Beentje, H. J. (2012). Guide de Terrain des Arbres de Burkina Faso. Kew Publishing, Kew. Wyk, B-E. van, Oudtshoorn, B. van & Gericke, N. (1997). Medicinal Plants of South Africa. Briza, Pretoria. Wickens, G. E. (1995). Potential Edible Nuts/Edible Nuts (Non-wood Forest Products 5). Food and Agriculture Organization, Rome. Kokwaro, J. O. (1986). Anacardiaceae. In: Flora of Tropical East Africa, ed. R. M. Polhill. Balkema, Rotterdam. Dale & Greenway, Kenya Trees and Shrubs p. 30, fig. 6 (1961). van der Veken in Flore du Congo Belge et du Ruanda-Urundi, 9: 67 (1960). Cufod., Enumeratio Plantarum Aethiopiae Spermatophyta (Supplement in Bull. Jard. Bot. Brux.) p. 467 (1958). Keay, Flora of West Tropical Africa, ed. 2, 1: 729, fig. 199 (1958). Exell & Mendonça in Consp. Fl. Angol. 2: 130 (1954). W.J. 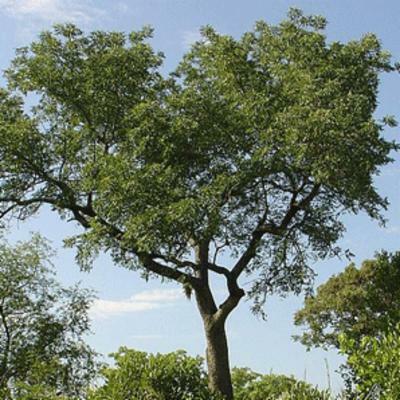 Eggeling, Indigenous Trees of the Uganda Protectorate, ed. 2: 14, fig. 3 (1952). J.P.M. Brenan, Check-lists of the Forest Trees and Shrubs of the British Empire no. 5, part II, Tanganyika Territory p. 38 (1949). Engl., A. Engler & K. Prantl, Die Natürlichen Pflanzenfamilien III, 5: 152 (1892). Oliv. in Flora of Tropical Africa 1: 449 (1868). Hochst. in Flora 27, Bes. Beil. : 1 (1844).